Info "Blow as hard as you can to push the ball back at your friend's face!" In Your Face is a microgame found in WarioWare: Touched! in the Mic Rocking stage. The objective is to blow into the mic to push the object back at the top screen character. 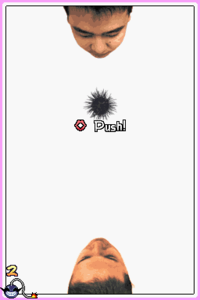 1st level difficulty: The player must push a spiked ball. 2nd level difficulty: The player must push a spiked ball, while the ball starts close to the player. 3rd level difficulty: The player must push a bomb at three people. This page was last edited on April 7, 2018, at 05:24.